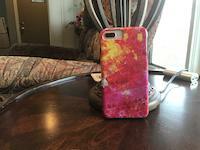 Abstract Color Relationships Ll iphone x case by Michelle Calkins. Protect your iPhone X with an impact-resistant, slim-profile, hard-shell case. The image is printed directly onto the case and wrapped around the edges for a beautiful presentation. Simply snap the case onto your iPhone X for instant protection and direct access to all of the phone's features! Like the way the colors play off each other - nice piece! This is part of a set of four color studies that come together to make one painting. It comprises of a rainbow of colors and patterns.